French double barrel pinfire shotgun. Very nice Lefaucheux system pinfire shotgun in a very good+ condition. Excellent steel barrels with French proof marks. Right barrel is marked E.M. and left barrel CHOKE. 16 Bore. 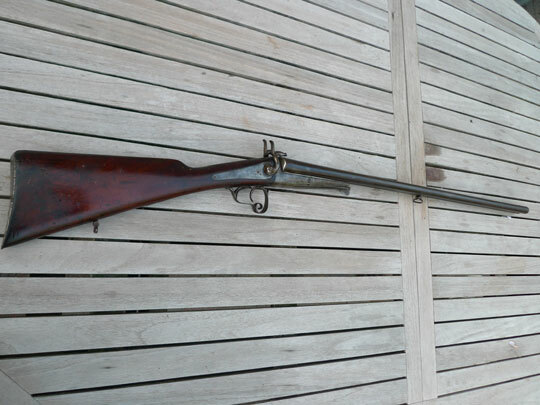 Barrel length 74,5 cm/29 Inch Very good closing breech. Underlever system. Excellent English syle wooden stock with no dents or cracks. Metal but plate. Strong working back locks with nicely shaped hammers.